To provide some new and exciting categories in the annual NSW Boys Group Review Education Competition, 2016 will see a brand new category – the Group Build. This category will see a common subject aircraft chosen for the year, and members can then build a model based on this subject. The concept has been used very succesfully in a number of modelling clubs, and Squadrons are encouraged to get their cadets participating in the category with their modelling program. It also has the advantage that once the model is purchased the same paints can be used, making the whole project easier to manage and financially more attract for cadets and Squadrons. For 2016 the chosen subject will be the iconic Supermarine Spitfire from World War 2. 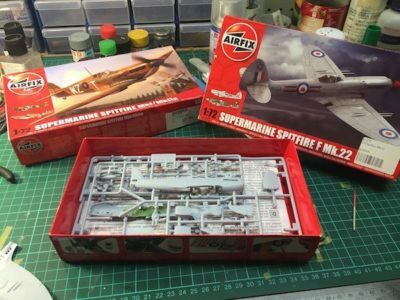 The model must be in 1/72 scale, however you are free to use any brand and variant – with 24 different variants of the Spitfire operated by over 30 different nations there is a huge variety! You might even do a Spitfire on floats or a pink Spitfire! If this new category proves succesful, for 2017 the subject aircraft will be chosen by popular vote. Note: Models in the Group Model Build Competition must be of the Plastic Kit variety. No Metal or Plastic Pre-Built Models, Snap Together Kits or Lego models will be accepted. To make the competition accessible to all members, the model is to be built OOB (Out of Box) with no major modifications or 3rd party add on kits accepted. The instructions and box must be with the model.